Every singer or professional speaker wants a crystal-clear microphone that really brings out the best in their voice. popular Evolution series, which is favored by professional musicians such as Ed Sheeran. technology out of the studio and into your stage performance. This makes it an excellent choice for creating live recordings at concert venues. 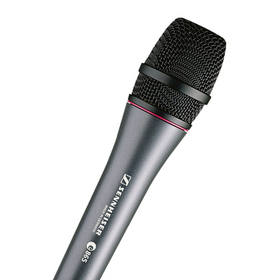 Coming in at 311 grams and just over 7 inches long, this Sennheiser condenser microphone is portable and unobtrusive. levels, making this product suitable for performers who like their music loud. in your voice because of its high sensitivity. It can also be used to pick up an acoustic guitar or wind instrument. You'll be impressed with the presence, clarity, and smoothness afforded by these microphones. pickup pattern. This type of pattern is designed to offer superior feedback rejection and reduction of off-axis color. It's best placed with a monitor directly behind it to keep the feedback to a minimum. If your singing style brings you millimeters from the microphone, you don't need to worry about the proximity effect with this piece of equipment. This product also includes some handy accessories, including a microphone clip and a pouch for convenient transportation and storage. to have a single, versatile piece.